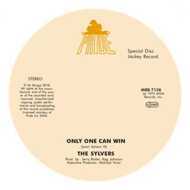 MORE FUNK-SOUL GENIUS FROM THE SYLVERS, AS SAMPLED BY J DILLA ON ‘TWO CAN WIN’, AND MANY MORE OTHERS. CUT LOUD AND PROUD AT 45RPM. ‘Fools Paradise’ is a midtempo soul/funk jam taken from the first ‘The Sylvers' LP. A favourite at Mr Bongo HQ that we felt needed to appear on a 7”. Beautiful, golden-era soul written by Leon Sylvers III, produced by Jerry Butler and Keg Johnson. Licensed from Pride Inc. 2006. Official Mr Bongo reissue.